Should be shooting each other not building things. It's not even building, really, it's just placing things. Wouldn't you all rather being trying to kill each other instead of holding a key down while an object is placed? Support Engineer equipped with AT mines, ammo and LMG, I know what I am going to do in Beta. "Will these guns be able to be moved by a player, or perhaps a player and another squad mate (to promote squad play)? I ask, because in most of the videos I've seen these guns are being towed and dropped in the middle of streets, when ideally the player may want to move the equipment somewhere that requires a more direct, albeit slower, touch. Seeing squad mates work together to slowly wheel these guns into more detailed places would be great for the pillars Daniel Berlin mentioned in his interview with Jackfrags (i.e., squad-play, immersion, and tactics). Additionally, I was a little disheartened when I saw that that the AT gun has no reload animation, like what was present in BF1. That was incredibly immersive and would be wonderful to see." Ironically, the best shooters don't have "shooting people" as the only thing you need to do to win. Like in real war. By the time you pull the trigger, you want to be damned sure you won't die easy if bullets come back at you. Taking a few seconds to do something tactical is not a waste of time or something you shouldn't be doing. Defensive play is essential to stop BF becoming a headless chicken run-and-gun kids game. Often looking at the spawn map in BF1 is like looking at a kids football game. Everyone is clustered together chasing the ball. No defense, no position, no tactics. It's a Gimmick like the Behemoths. Only building I see being useful is from supports with Mounted guns. None of you mention the existing problems in all previous Battlefield games. As soon as you become stationary you will get shot in the head by a sniper. Why do you think no-one use placed machine guns in BF1? Because you die instantly from a sniper bullet. 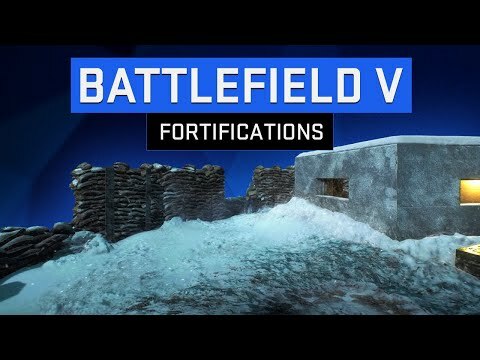 In BF5 it will be the same, you either die when building or you will die as soon as you stand up behind the fortification. It could be worth building, but I think if we take a hit then the process stops and we have to start again. Not useful after my experience with the Alpha and are a gimmick. We might see forts being built about as often as I see the light flare in BF1. Well this building might help me from always getting killed. I heard it mentioned that one potential use for building beyond the obvious intended usage is to have each piece of construction increase the time it takes to capture a flag. That would make it both important to build and then soften up points to ease capture.